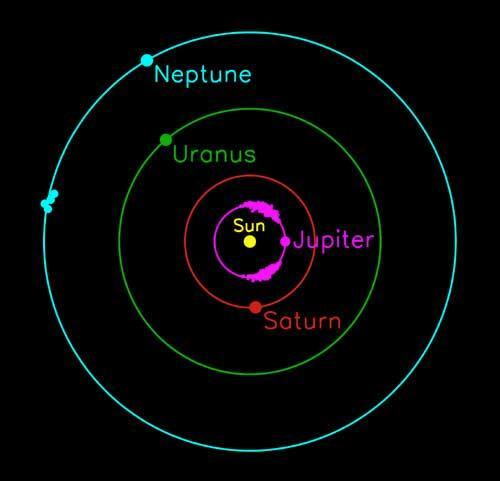 Location of known Neptune and Jupiter Trojans. A Neptune Trojan is a Trojan asteroid that shares the same orbit as the planet Neptune. Four Neptune Trojans are known at the time of writing (June 2006): 2001 QR322, 2004 UP10, 2005 TN53, and 2005 TO74. They lie in an elongated, curved region around the L4 Lagrangian point, 60° or about 5 billion kilometers ahead of Neptune. One of them, 2005 TN53, is unusual in that its orbit is tilted 25° relative to the plane of the solar system. Such a large tilt is unusual for asteroids and the fact that among the handful of known Neptune Trojans, one has an orbital inclination so high suggests, on a statistical basis, that Neptune Trojans may eventually be found to outnumber Jupiter Trojans (or which about 2,000 are presently known) and that they may fill a thick disk about the L4 point. The known Neptune Trojans are estimated to have diameters of 60 to 140 kilometers. From a statistical analysis based on the 25° tilt of 2005 TN53's orbit, researchers have inferred that Neptune may have between five and 20 times more of these large objects than Jupiter does. Jupiter has only one known Trojan in this upper size range. Based on this difference, astronomers estimate that Neptune's smaller Trojans also outnumber Jupiter's. Other research implies that Jupiter may have about the same number of asteroids as the main asteroid belt, so astronomers indirectly conclude that Neptune Trojans may outnumber the tens of thousands of asteroids in the main asteroid belt. However, because Neptune is farther away, spotting these rocky objects is difficult. A cloud of asteroids at the L5 point, 60° behind Neptune, has not yet been seen but is predicted to exist. One reason why no L5 Neptune Trojans have yet been discovered is that, given the present location of Neptune relative to Earth its L5 point lies in the same direction as a dense backdrop of stars in the Milky Way, which makes spotting faint asteroids difficult. However, planetary motions will make for a better view of any trailing Trojans in about 30 years.